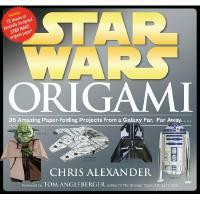 If you are planning a trip to San Diego Comic Con this year, be sure to stop by Room 7AB from 2:00pm-3:00pm on Friday, July 13th for the STAR WARS ORIGAMI folding session with author and master origami artist Chris Alexander. Chris will be leading a hands-on class, giving fans step-by-step instructions on how to fold an exclusive Comic-Con Boba Fett helmet, as well as a lightsaber and Han Solo in Carbonite. This is an event you won?t want to miss! The Jedi Master of origami, Chris Alexander teaches young Padawans how to fold 36 amazing projects from a galaxy far, far away. All your favorite characters, creatures and objects from the Star Wars universe are here. Included in the book are 72 sheets of specially designed origami paper, so that once folded, the models look like they stepped out of the movie. Chris Alexander began doing origami at the age of four. Since then he?s created dozens of original designs, many of them Star Wars themed. He has a large Star Wars fan base and tours the country folding at conventions and museums. His website is www.starwarsorigami.com. He lives in Lancaster, California. July 2, 2012 SDCC Sunday: What's On The Schedule For Star Wars Fans? July 1, 2012 SDCC Saturday: What's On The Schedule For Star Wars Fans? June 30, 2012 SDCC Friday: What's On The Schedule For Star Wars Fans? June 30, 2012 SDCC Thursday: What's On The Schedule For Star Wars Fans?